What a ride it has been for Lake Michigan anglers over the last several years. Ups, downs, and a lot of in betweens have occurred as the Lake Michigan fishery continuously evolves. As that evolution takes place, fisheries biologists are forced to adapt their studies and recommendations on the fly, while state officials and managers are required to re-adjust stocking levels. At the bottom of that ladder you’ll find fishermen, who are left to adapt new ideas and tactics in order to be successful. But after all isn’t that what fishing is all about? Isn’t it about the never-ending challenge of trying to break the code of another species all while trying to tame and understand mother nature? Despite the doom and gloom that has surrounded the last decade on Lake Michigan, there has actually been some pretty great fishing in all 4 states that border this huge body of water. The key these days seems to be a combination of networking with other fishermen, patience, and being opportunistic, all while managing your expectations. As we’ve done before we’ll try to take a short glimpse into the past, in an effort to make an educated guess about what the future might hold. 2017, the year of the Coho Salmon? 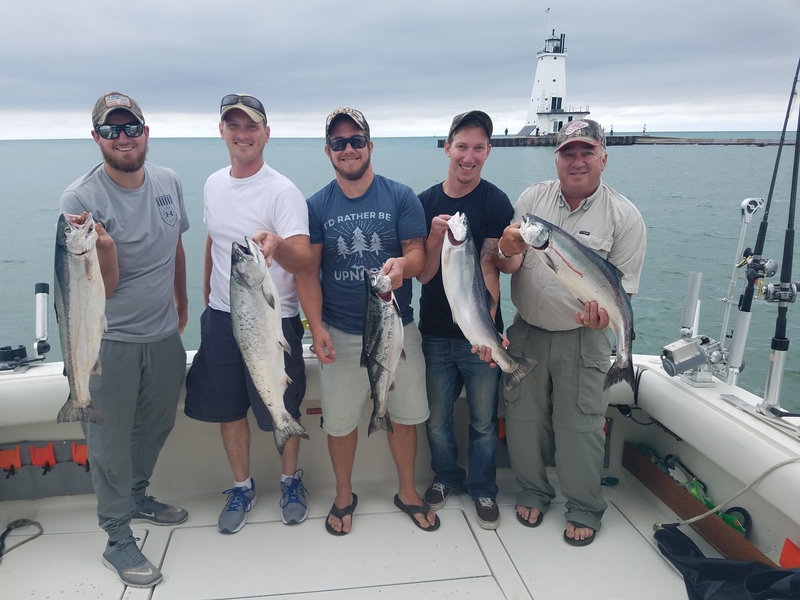 April has always been a Coho Salmon month in the southern ports of Lake Michigan, but 2017 seemed to be better than most. There was a twist though, the way anglers are catching them was a little different than it used to be. It wasn’t too long ago that most fishermen would target the shallow nearshore depths along the beach using shallow diving crankbaits, small dodgers, and spoons for these silvery escape artists. The last few years have found the majority of fishermen targeting the offshore waters in the early season, with a portion of their spread dedicated to traditional springtime Coho Salmon lures in the top 30’ off the water. These shallow fish are very likely to be preying on small bugs that are hatching near the Lake’s surface. But another portion of anglers’ spreads have been devoted to the deeper parts of the water column from 75’ down to 200’ or even more. Most would think those deep fish would have to be Lake Trout or even immature King Salmon, but on many days those fish were actually Coho Salmon. But what the heck were they doing down there? The reason for this was simple once you start investigating the stomach contents of these fish. Coho Salmon, much like fishermen, are opportunistic and typically will take the easiest meal they can find. The deep water Coho Salmon were normally gorged with Bloody Red Mysid a small, invasive shrimplike crustacean that has seen its population drastically increase in Lake Michigan over the past several years. But there may be another reason anglers caught so many Coho Salmon in the offshore waters during the 2017 season, and it may have less to do with Coho Salmon or those little shrimp they’ve been feeding on. It has been well documented that the alewife population of Lake Michigan has declined in recent years and with it so has the amount of King Salmon in the Lake Michigan. So, with an overall lower population of Kings, less fishermen are seeking out the shallows in the spring searching where they would typically find them. Because after all who would pass on a fast paced limit of Coho Salmon in the deep water to pry the shallows for a crack at a few King Salmon in the shallows along the beach? For now, the days seem to be gone where anglers would flock to those shallows during the spring months and fill coolers to the brim with King Salmon. But that doesn’t mean there isn’t great fishing opportunities on Lake Michigan throughout the season and even some great action on big Kings. Again, it just means that you have to be opportunistic and choose the right time to strike. Maybe those Coho have always been out in the deep blue waters during the spring months and fishermen were just too busy pulling those big tackle busting Kings out of the shallows to know or even care about it. Regardless of how many factors were involved, the 2017 season saw the best fishing and weir returns for Coho Salmon since 2002, which was certainly a welcome sight for anglers across the lake. What about King Salmon in 2017? 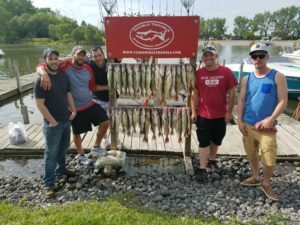 Fishing for kings across Lake Michigan in 2017 was similar to what it has been in recent seasons, fishing was good on some days and tough on others and limit catches were certainly not the norm. More than ever it seems important to network with other trusted anglers to see what’s happening around the lake and to target other species when the King bite just isn’t on fire in your port. Despite the inconsistent fishing, there have been some positives in recent seasons. First off, since the highly debated stocking cuts of King Salmon in Michigan waters in 2013 and 2016, the size of mature Kings has increased significantly and master angler sized fish have been more common. In 2017 there were a few fish weighed in the upper 30 pound range across the lake and even one from Muskegon that tipped a certified scale past the 41 pound mark! That shows that despite the disagreement surrounding the stocking cuts, they may indeed have produced the desired effect of bringing the King Salmon population more in balance with their desired forage fish (Alewife). Also, over the past few seasons the weir returns have rebounded slightly off their lows from 2015. No, that certainly doesn’t mean that they are back at their heyday levels, but at least they have improved slightly. The 2015 weir returns were the lowest on record, so any rebound we can get is a step in the right direction. On another bright note, Lake Michigan’s Alewife population has had a few decent hatches over the past few seasons. The Alewife classes of 2015, 2016, and 2017 were all enough to have a reasonable impact on the population. While far from bumper crops, they were still enough to offer hope of sustaining the forage population into the coming years. Finally, there is some evidence that the Quagga Mussel population has begun to decline in different areas across the lake. Since invading Lake Michigan in 1998, these mussels have wreaked havoc on the food web lake wide. As they have taken hold, they have all but eradicated their cousins the Zebra Mussel, while make Lake Michigan much less biologically productive than in the past. Perhaps this new data is a sign that they have reached or even exceeded their carrying capacity. If this decline continues, it should free up some nutrients and make Lake Michigan more productive in the coming years. Let’s hope that’s the case. So, what does it all mean for the fishing this year? As always predicting the future of a fishery as complex as Lake Michigan is never an exact science or a guarantee. 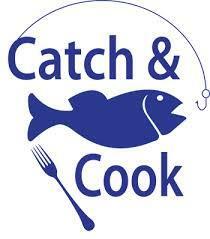 But it’s likely a fairly safe bet that the fishing should be similar to the way that it has been in recent seasons. A slight bump in the Alewife crop and natural King Salmon recruitment may even lead to slightly more productive season. But those expectations must be kept in check. As we’ve warned in the past; if you are only to going to be satisfied when you break the hinges off your cooler because it is stuffed with mature King Salmon, you’re liking going to be very disappointed on most days. That’s not to say that there won’t be some great fishing for Kings from many ports this season, just choose your time-frame and location wisely. Listen to fishing reports from trusted sources, talk to locals and friends, call the local bait shop to get the scoop, When the time is right don’t wait. Get out there and make it happen. Because there is no telling how long that action will last. On the days where it seems like a healthy cooler of Kings just isn’t in the cards, you’re likely better suited to think outside the box. Maybe hitting some clay or rocky bottom structure and targeting Lake Trout is the best way to fill the bucket. Or maybe you’d be better off to load up your best Steelhead and Coho baits and make the long trip offshore on a calm day. Who knows you may even find decent mess of immature King Salmon mixed in with the other species. The point is that Lake Michigan isn’t a one-dimensional fishery, so why sell yourself short as a one-dimensional fisherman? We should never stop striving to learn more and become better today than we were yesterday. And this nonstop learning and adapting process has never seemed more important to Lake Michigan anglers as it does today. As usual we never know for sure what the future will bring, but Lord willing we all be right in the middle of another fun and action packed season on the big pond.